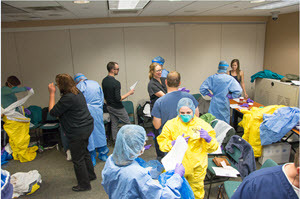 Recently training sessions took place at WISER for step-by -step Personal Protection Equipment donning and doffing for healthcare professions within UPMC Emergency Department. Instructors demonstrated techniques on how to carefully place and remove each piece of level 1 and level 2 Ebola PPE. After the demonstration, participants broke into groups of two where they were able to practice the donning and doffing themselves in order to ensure proper placement of the equipment.